Nearly everyone will know that week 4 of the summer cruise did not go to Tom’s careful plan to hop from Deganwy, North Wales via the Ilse of Man, Northern Ireland and several good restaurants to Troon, since without a propeller we were ‘stranded’ in Caernarfon. The crew were Richard Ash and Judith Hankey who stayed from week 3, Tom Lynch as skipper and Chris Deakin as mate The week can be divided into two parts first the procurement and fitting of a new prop and then the 36 hour, 200nm mad dash to Troon. First the procurement and fitting: Friday’s GOOD news in week 3 was that we had no propeller, because if it had been the alternative of a gear box fault that would have meant a few weeks of custom gear-box re-build which would have pretty much brought the whole Summer Cruise planning in to disarray. However, by the time we knew that we needed a new propeller, the X-Yacht supplier had closed early for the weekend which was then spent shopping, eating, refuelling via jerry cans and much discussion of “what ifs” over some beers and wine. Monday morning on the phone Richard established that Flexofold, the propeller maker in Denmark, had one composite propeller in stock and they would send it on next day delivery on UPS which immediately lifted the mood. But, to fit our drive shaft a special Yanmar spacer was needed and the Yanmar Distributors said there were none in the UK and it would be 3 weeks to get one! Mood turns to despair again and then deciding not to give up just yet, the phone call game really started, with Richard, Tom and Chris going through every UK distributer of Yanmar parts until on the about 12thcompany they called they found one in stock and this company in Dorset could ship next day to Caernarfon. So, spirits lifted once more. The marine engineering company had an office nearby and someone to receive parcels available all-day Tuesday, so we would be ready for a lift-out and fitting on Wednesday. 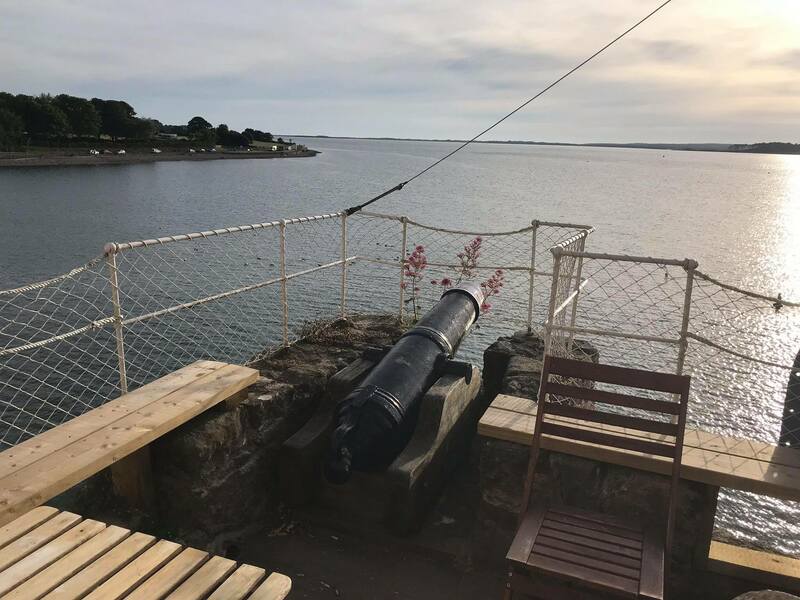 The marine engineer arranged to borrow a powerful RIB and by Wednesday, as the week moved to spring tides, there would just be enough water to get into the locked Port Dinorwic dock with a suitable hoist – so the plan was all coming together. This meant that if we could get out of the Menai Straits on Wednesday evening then we could get the cruise back on course and arrive in Troon for the planned Saturday handover. Tuesday morning at 6am Richard woke early and checked where the propeller was (it should have been in the UK) and found it was still in the town of Vejle, localto Flexofold, in Denmark. UPS had screwed up. This was very frustrating, coupled with there being no human to contact at UPS and once again the mood was dampened. Flexofold who were UPS’s customer contacted them and got an acknowledgement that something had gone wrong and the next day premium would be re-funded, which was not the point but that it would be with us on the Wednesday. The Yanmar spacer arrived as expected so the plan was still on, but it would be tight. By Wednesday the situation improved as the propeller was now in the UK and in the late morning we were towed up the Menai Straits to Port Dinorwic by a powerful RIB at high water with free flow on the dock gates. The RIB left us and we pulled ourselves along the moored boats to the hoist at the far end using warps and our two boat-hooks. As we approached the hoist the guy pointed out the electric cable which crossed the dock under the water and he was pleased that we had cleared it. The dock gates closed after high water and we waited for the propeller to arrive which it did at 2:30pm. We convinced the dock staff that we really did want to leave on the evening tide (10pm) rather than the following day and the hoist men agreed (later rewarded some folding beer money) to work late to ensure we were back in the water that evening. So, we were lifted with only a few inches clearance onto the hard and Richard and the marine engineer started to fit the new propeller. Every precaution was taken to ensure it would not come off again, which meant Richard with the torque wrench and the engineer (a big lad) with an extension bar of a socket set bracing it. Plus ensuring that the tab washer was correctly located and the built in pre-loaded ‘Loctite’ on the fittings was all as it should be. The gear box oil was also flushed and refilled with new oil. Going back into the water our mood of jubilation literally took a jolt as the four crane hoists seemed to jam and would not lower Relax back into the water. After several minutes of head scratching and discussion the boatyard crew decided the lifting straps had to be changed to shorter ones. So, Relax was placed back on the hard, propped up, and the lifting straps changed. The relief was palpable when she eventually lifted off the hard and was lowered back into the water. … and the new prop fitted. We started the engine and engaged forward gear poling ourselves out from the moored boats in the narrow dock channel, but we caught the electric cable crossing the dock with the keel and had to manoeuvre ourselves astern to clear it before pushing out further with the boat hooks and this time cleared the cable. The hoist guy said the lock gates leak and the water goes down several centimetre between each tide, so we only had a few decimetres of water below the keel as we edged our way down the dock under a lift bridge to the lock gates at about 6pm. We moored up, had a meal as the tide rose, and left Port Dinorwic about an hour before high water at 10pm and motored against the last of the flood tide to the Caernarvon bar as the sun set. The skies were completely clear and it was windless and we could see the full moon first over Snowdon and then over Caernarvon castle as we motored south west along the Menai Straits. 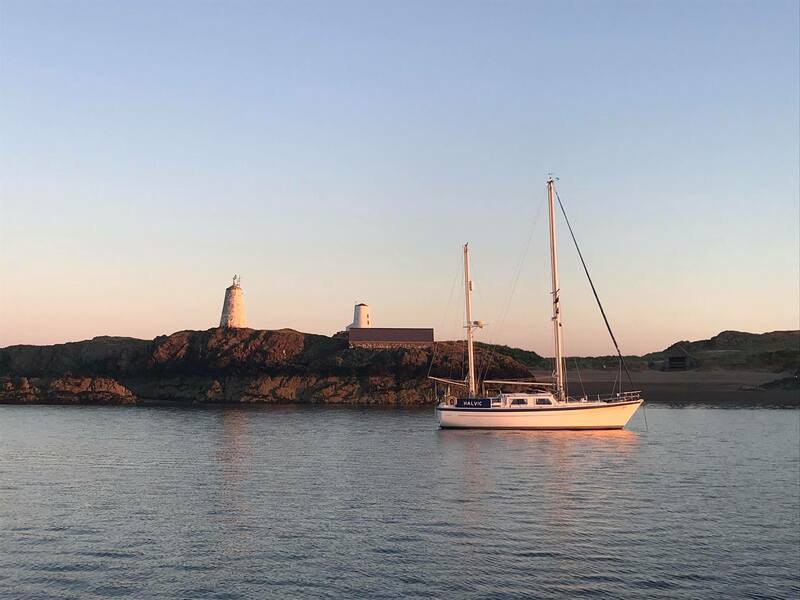 The water was completely calm, and we crossed the bar as the tide turned, following the channel buoyage guide produced by the harbourmaster, and then on to Pilots Cove east of Llanddwyn Island arriving at midnight, to wait out the ebb. We anchored at Pilots Cove for a very short sleep and set off again about low water at 5am on Thursday to maximise our rising tide north. The Irish sea has a useful feature in that you can carry the rising tide north and then if you have made enough distance northwards in that time you also benefit from the ebb which goes out northward through the North channel, so you get two consecutive tides with you. So, we were hoping that with an ideal wind and Relax’s now renowned boat speed we might just be able to complete the 160nm miles to Troon in a single passage. We manged to sail for a few hours mid-morning on the Thursday but we had to keep the speed up so it was back to motor-sailing for most of the trip. However, we could not make enough distance for the tidal gate through the Horth Channel and on Thursday afternoon, after 95 miles, Tom selected Knockinelder Bay in N Ireland to anchor and wait out the south going rising tide. We had supper, rested for a few hours, and then set out again at 11pm and after hoisting the sails, and clearing the local obstacles by 1:30am, we went onto watches for the short night. It was light again at 3.30 as we passed the Mull of Galloway and we arrived at the Ailsa Craig at 8am. We were back on schedule then and went into the one port which was on Tom’s original plan for the Friday afternoon, the lovely Lamlash on Arran for lunch. 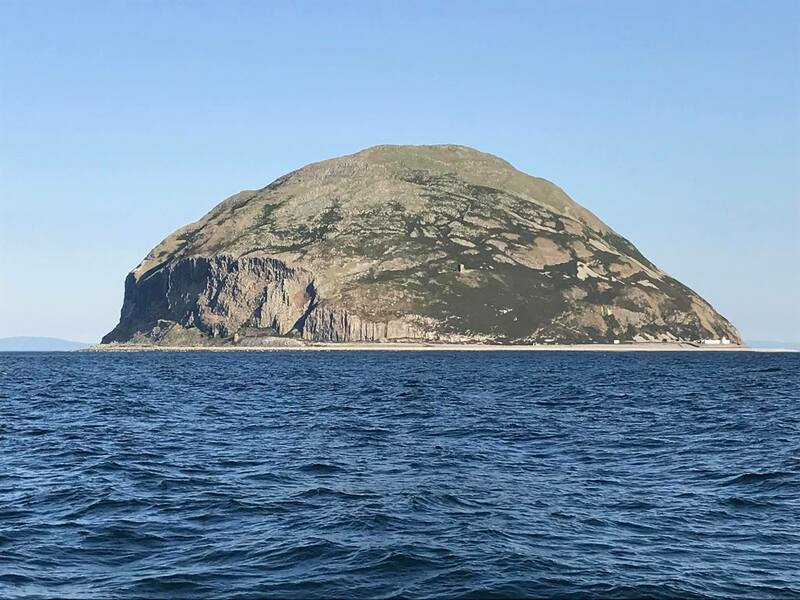 We were in Troon by late Friday afternoon and all felt a huge sense of relief that the summer cruise was back on track and the next crew could depart as planned on Saturday evening for their week up to Oban. So as a place to be stranded Caernarvon is pretty good, lots of places to eat, lovely spot in itself (especially if you like castles) and the weather and company was excellent. 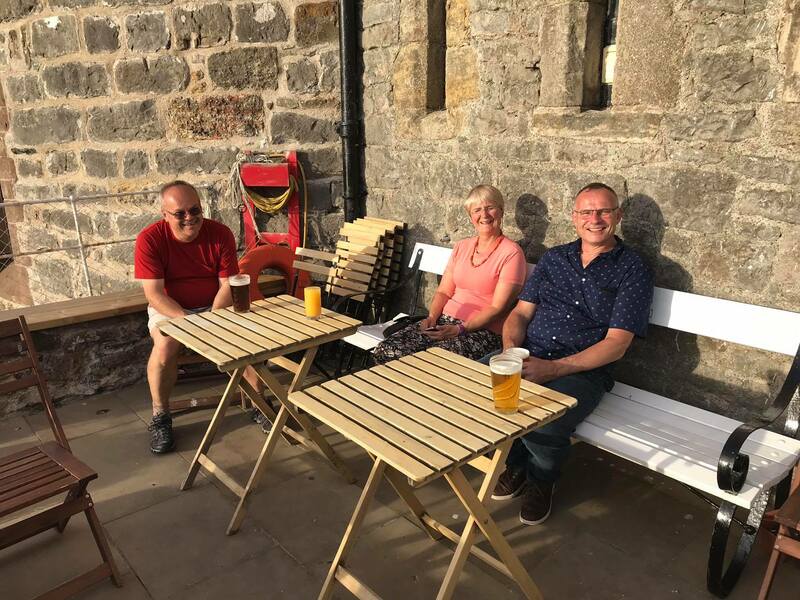 We visited the Royal Welsh Yacht Club which apparently has the oldest yacht clubhouse in the world as it is part of Caernarfon Castle and enjoyed sundowners on the ramparts terrace in lovely sunshine. We made the most of our prop-less time with some tourist activities too, such as comparing the artisan dark chocolate ice cream of Beaumaris and Conway (equally as good), walked the medieval walls of Conway (a UNESCO world heritage site), in the heat of the midday sun of course, and when did you last eat a fish finger butty? We also did some preparation for our re-fit such as buy another longer boat hook from Conway chandlers, talk to the hoist people face to face in advance about her draught, photograph the mud banks outside Port Dinorwic Lock gates at low water to calibrate the drying height shown on the chart. Just in case we also visited Holyhead to see the remains of the marina there and view the visitor moorings and the harbour walls since it would be our first potential port of refuge. 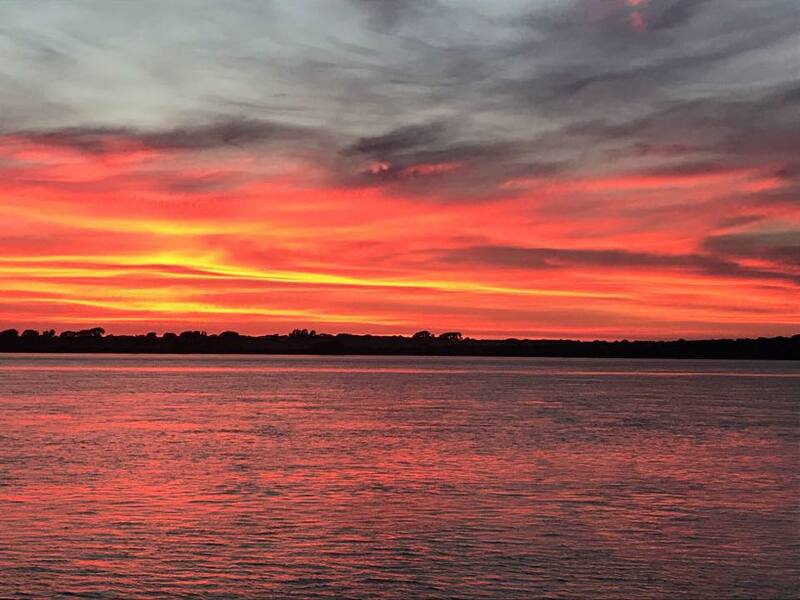 We also have to say how impressed we were with all the people we dealt with and who helped with our issues, the Caernarfon Marina staff, the engineers, the boatyard crew at Dinorwic were all fantastic and went out of their way to get us and the PYC Summer Cruise back on track. This week really showed what PYC was all about, members working together as a team, tackling whatever adversities were thrown at them and sharing and supporting each other through the highs and lows of what proved to be a very interesting and, in the end, rewarding week! Great article and photos and, as you say, club ethos at its best! Commodore’s Highlights – At Last! I’m Off The Hook! Commodore’s Highlights – Celebrating our 25th Anniversary! Racing To Get The Races In!